We’ve always believed that the mark of a good doctor is one who teaches his patients to self-diagnose. Not because you’ll be able to mickey mouse a solution together out of hydrogen peroxide and a tenacious spirit, but because we can get to the root of the problem more efficiently. In regard to dental work, it can be painful to try and puzzle out through trial and error in a way that is hard to escape in regard to many ailments. If you understand your teeth and how they work, how your breath smells and how your gums feel when something is wrong, then you won’t have to think twice about making an appointment to come to the premier Missoula dentist to solve your problems. Together, we can take the guesswork out of your health and continued physical upkeep. A large piece of understanding your own oral health and learning how to recognize where the problem lies begins with understanding the basic components of your oral blueprint. Every piece of your oral health starts from your teeth. They’re an extremely important part of your day-to-day life, not only in the sense that they help you eat and digest food, they also impact how we speak and a large part of the rest of our health. Let’s just say, there’s a reason you check the horse’s teeth when you’re purchasing him. Building a solid base of knowledge about oral health, you’ll start being able to troubleshoot potential problems with finesse. Your tooth is made of of two essential parts: the crown and the root. The crown is defined as the portion of the tooth you can see, the white part above the gum. The root is defined as the portion of the tooth that you cannot see that is anchoring your tooth in your mouth by attaching to the bone. You’ll find several different types of tissue in your teeth and each type serves a different purpose. You’ll find enamel, dentin, cementum, and pulp in each and every tooth in your mouth. Enamel acts as a protective layer over the crown of the tooth. It’s invisible and is actually harder than bone. It’s fashioned from a mixture of hydroxyapatite, calcium and phosphorous and it performs its duty of protecting the rest of the more delicate tissues very well unless it starts to wear down. Of the other tissues that make up the composition of your chompers is “dentin”. It’s the second line of defense underneath the enamel. It’s a calcified substance that looks very much like bone though it’s not as hard as enamel. If the enamel wears away, your dentin won’t last long in the way of protecting the rest of the tooth’s tissue. The third type of tissue is the meat and potatoes of your actual tooth. It’s called cementum and it’s the tissue covering the root and anchoring the rest of the tooth to the bone. It’s pretty soft tissue and relies heavily on dentin and enamel to do the heavy lifting as far as protecting the tooth itself. In fact, the best way to protect the roots of your teeth is by staying on a decent regiment with your gum cleanings. If you can see cementum, you’ll recognize it by its light yellow color beneath your gums. If you can see it, the tooth has decayed quite a bit, or the gums are receding severely. This implies that the gums are diseased and that they’re shrinking away. Cementum is very vulnerable to bacteria and plaque and if you believe you can see it, it’s best to schedule an appointment with your Missoula dentist at Bitterroot Dental sooner, rather than later. Lastly, your tooth consists of some pulp. This tissue acts as the center of your tooth and it contains a variety of blood vessels and nerves. It’s the direct path your body sends nutrients along to your teeth to use. You’ll find that your teeth are all shaped slightly differently and that’s because they’re meant to perform different tasks when chewing and assisting with the digestion of your food. Understanding the role each tooth performs in will help you hone in on the problem and adjust your self-diagnosis. In your mouth, you’ll find incisors, canines, premolars, molars and third molars. You’ll recognize these as the eight Chicklet looking teeth at the front of your mouth. There are four on top and four on the bottom of the mouth and they’re specially created to act like little blades to bit into your food. Because of their simplistic, edge dominated structure, you’ll have very few issues with these teeth. There’s also the fact that most people tend to focus on only their incisors when brushing their teeth because of ease and perhaps a touch of vanity. You’ll know these as those pointy little Dracula fangs flanking your incisors. You’ve got four canines, they form as two on top and two on the bottom and they’re used for tearing into meat and ripping your food apart. They’re your sharpest teeth and are probably the second most brushed type and thus, it’s unlikely that you’ll have problems with these teeth alone. If symptoms or issues arise in that area it’s more likely to be due to poor gum health overall, rather than just in that spot. You may know these little guys as your bicuspids. They’re specifically for chewing and grinding up your food. They’re fairly blunt and they appear in two sets on each side of your mouth, top and bottom. Alongside traditional molars, you’ll see most tooth decay and cavities appear here. You’ll rarely see a gold tooth in the front of a mouth, but they’ll regularly replace premolars. Just like bicuspids, they’re merely used for grinding up your food, but they tend to be less sharp than your premolars. When they grow in, they don’t actually replace any teeth you lost as a baby, they merely push all of the new teeth up as the jaw bone gets bigger. You’ll know these as wisdom teeth and very few of these teeth stick around into adulthood. Half of them never even breach the surface. They don’t erupt until around the ages of 18 to 20 and that’s if they appear at all. If they do erupt, it’ll likely be a pretty painful experience and it often only causes more pain as few adults actually have jaw bones big enough to support that last tooth on both sides. It’s best to remove them before they cause you another round of braces. If they don’t fully emerge, they become a breeding ground for infections and other issues in your mouth and should be removed sooner rather than later. Understanding the composition of the components in your mouth can help you maintain the proper upkeep for your oral health. Molars of all kinds are problem areas that should help you adjust where it is you’re brushing and for how long. Being mindful of how you brush and what kind of tools you use can decrease the likelihood of future oral pain and issues. While oral health is complicated, the composition of your mouth is simplistic and thus having a good knowledge base can help you avoid future pain and dental costs. What you eat and drink washes past the sentinels of your mouth and either hinders or helps your oral health. Being careful about what food and drinks your teeth come into contact with can totally have long-term and short-term effects on your oral health and be conscious about what you’re putting in helps you achieve the results you’d like. Promoting oral health through your food choices will also promote overall health in general. So if your teeth are the excuse you need to start eating right, the effects may be even better than just having to come to your Missoula dentist with fewer cavities. We know, that’s much easier said than done. Even most diet places now acknowledge that it’s better to try and avoid products with sugar content over 15 g rather than sidestepping the stuff entirely. Cavities are a generally inexpensive but annoying issue to come across in your oral health. However, they’re linked to a diet that consists of sugary and sticky foods. The more you limit sugar intake the healthier your entire body will become. Try avoiding candy and cake alongside sugary drinks like sour beers, sodas and energy drink as they’re chock full of sugar. If you’re needing a sugar fix, try searching for a package that has less than 15g of sugar. Be cautious of cereals, canned fruit, yogurt and even spaghetti sauce as just about everything has sugar nowadays. Sticky foods stick to the surface of your teeth and turn the inside of your mouth into a bacteria breeding ground. Foods like raisins, honey, bread, and anything else you can think of that leaves a coating over your teeth should be avoided. However, if you have a pretty reasonable oral hygiene schedule with good products established, these foods when consumed in small quantities shouldn’t cause huge problems. Fortunately, the rule of “everything in moderation” can be applied to this rule a little more than the others. Tomatoes and oranges and other citrus fruits are a key part of a well-rounded diet. Too many of them can start to negatively affect your tooth enamel. If you try balancing them by making them apart of a meal you won’t eat as much of them and you’ll still get that crucial part of a healthy diet without overdoing the acidic intake. It’s not a lie, coffee, tea, red wine and more are very likely to start staining your teeth. The color pigments within them called chromogens to attach to the tooth enamel and stain the tissue in the same fashion that it stains the drink. You can still drink these things and be fine, just be sure to wash those chromogens away with plenty of water so that they don’t get a chance to stick. The more anti-inflammatory foods you eat the better. If your gums are happy and not swollen, chances are that the rest of your body is too. In fact, several clinical studies support that anti-inflammatory food actually decrease tooth loss and result in healthier gums as a whole. Create a diet that includes fewer carbs and trans fat and decrease the total caloric intake. Reducing salt in your diet will help with how much water weight and swelling you hold as well. Healthy fats are a main fixture in an anti-inflammatory diet. These foods include olive-oil, fatty fish like salmon and avocados. Omega-3 fatty acids are still pretty in-style, though fewer people are carting around those little melty cartridges fully of the fishy smelling oil. Instead, merely incorporate more olive oil and coconut oil into your diet to get those same properties without the potential of a fish oil capsule exploding in your pocket on a 90-degree day. We’re certain you’ve heard this before, but water is going to save you from every bad food decision you’ve made. At least, to some extent. Water is great for you and it protects your teeth while keeping your body full of nutrients. Using water to wash your teeth off after partaking in some sugary or acidic substances effectively wipes the slate clean. Here at Bitterroot, we believe that if you learn the basics of oral health and composition, you’ll start to become proficient at preventing oral health issues and recognizing them when they become a problem. This makes the 6-month appointment mark plenty to catch any potential health issues that you haven’t been able to take notice of yet. Together, we can create a dynamic host of dental services to give you the smile and health that you want and deserve. We proudly offer laser dentistry services so that when a problem does arise, you can visit us and your pain will end, not get worse. If painful dental appointments are steering you away from getting that tooth fixed, fret not. The laser opens doors to pain-free dental regimens and procedures that help us put you at ease while keeping your oral health in tip-top shape. By far the best dentist in Missoula!!! I first went to Dr. Duke for a regular cleaning while I was pregnant; I was very impressed by how helpful his staff was. I returned to have x-rays after my baby was born. I needed a lot of dental work done including having all four wisdom teeth pulled. They grouped all my work into as few visits as possible…which I great appreciated. Dr. Duke checked numerous times to make sure I was comfortable the whole time, even giving extra novocain when needed! He did such an amazing job pulling my wisdom teeth I have almost no pain or soreness! And saved me a ton of money by not going to an oral surgeon! Even called personally to check to see how I was doing! Thank you Dr Duke and everyone at Bitterroot Dental! When Dr.Duke began his practice in Missoula and upon the recommendation of several of my friends, he became our family dentist. Over all the years I have had dental service, I can honestly say I have never had better care. He and his staff are highly professional and everyone is pleasant! 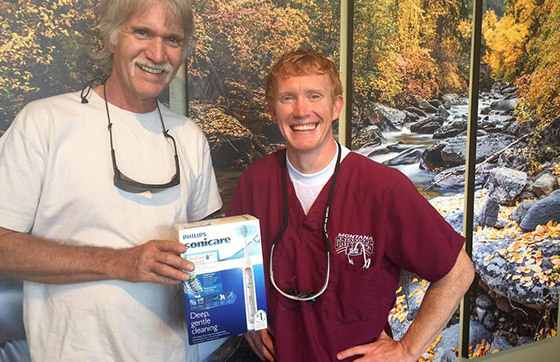 Dr. Duke truly cares for his patients and their dental welfare. When I learned I needed my sixth implant I was delighted to learn that Dr. Duke was amply qualified to do the implant! After removing the tooth and doing a necessary bone graft, I waited until the area was properly healed. When I returned for the installation, I admit I was somewhat nervous considering previous experiences. I was pleasantly amazed at the speed and accuracy in which he placed a perfectly positioned implant. His dexterity and accuracy bespoke of experience and confidence! My mouth never even noticed anything different! No pain and no after operation concerns have happened! By the way, I’m 84 years old. I am impressed by his know-how and efficiency. Dr. Duke did an implant and also a root canal for me. Both procedures went very well. I am impressed by his know-how and efficiency.